The King Abdullah Financial District ... iconic. Last year spelt a bonanza for Saudi Arabia’s transport infrastructure sector, with key awards made for the Riyadh metro, airports, roads and railway networks. The demands of a rapidly expanding population, the influx of religious tourists, and increasing industrialisation are all putting a huge strain on the existing transport network and demanding that the nation addresses the issue on a priority basis. Saudi Arabia has also accorded high priority to social housing to meet the needs of its growing population and with it comes the requirement to boost utilities, healthcare and education facilities. The country’s ambition to become a financial hub has also spearheaded the development of the King Abdullah Financial District (KAFD) in Riyadh, which will soon see the opening of its Capital Markets Authority (CMA) head office and other financial institutions. Confidence in its real estate potential is now seeing the development of the Kingdom Tower, the world’s tallest tower in Jeddah (see separate article), while in the Eastern Province the state-owned oil conglomerate Saudi Aramco is poised to see the completion of its showpiece King Abdulaziz Centre for World Culture – a tribute to its oil legacy (see separate article). And government efforts to diversify away from being an oil-reliant economy have fuelled the development of huge economic cities such as the King Abdullah Economic City in the Western Province and massive petrochemical ventures – all of which have created a vibrant economy where optimism has been high. However, the fall in oil prices, military intervention in Yemen and the instability in neighbouring Syria and Iraq have put a damper on market sentiment in Saudi Arabia, which until recently had a robust and rapidly rising pipeline of projects. Another factor that has impacted the market is the recent crackdown on visas and immigrant workers, which has created severe labour shortages in the country and diminished profit margins. Business Monitor International (BMI), in its 10-year forecast of Saudi Arabia’s infrastructure blueprint, however, states that the dramatic fall in oil prices is not an immediate threat to infrastructure financing in Saudi Arabia, given the country’s significant foreign reserves and the importance of infrastructure development to economic diversification plans. BMI sees 2015 being a bumper year with real growth at 10.5 per cent year-on-year, and average growth over the forecast period at 8.8 per cent. 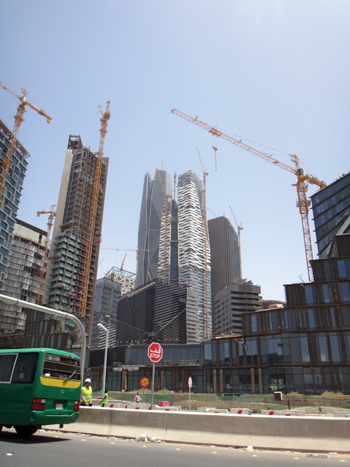 Over the short term, the main growth driver will be the infrastructure sector, while over the medium-to-long term the residential and non-residential sector will take the lead in providing opportunities in the GCC’s largest construction market, the report said. Some industrial construction projects may be cancelled or postponed, specifically in the petrochemicals sectors while manufacturing, metals and chemical projects should remain on track. Housing will be a top priority for the government, which has pledged a $67-billion spend on affordable housing. Real estate consultancy JLL has put the housing shortage at one million in a recent report, calculating that the country needs to make at least 200,000 homes available annually to keep up with demand, before any progress is made in bridging the housing gap. The transport sector will grow in real terms by 7.8 per cent this year, said the BMI report, with work on the Riyadh Metro well under way, and 450-km Haramain High-Speed Railway likely to begin operations this year. The BMI report states that in the coming years, Saudi Arabia may have to rein in its spending, owing to lower oil prices. However, despite fears that the dramatic plunge in oil prices in late 2014 would lead to a reduction in the 2015 budgetary allocations, the budget envisions a record state spending of SR860 billion ($230 billion), up 0.6 per cent from the 2014 budget plan. Indicative of the continued focus on infrastructure investment, construction firms with exposure to Saudi Arabia saw their share prices climb after the announcement of the budget: Arabtec, climbed 5.3 per cent while Drake & Scull gained 8.0 per cent. It is estimated that developers must build around 300,000 new units a year just to keep the deficit at 1.65 million homes. House prices in Saudi Arabia are expected to rise further on the back of high demand for homes and a slow rollout of developments, with figures suggesting housing requirements will continue to outstrip supply even as new projects reach completion. In a bid to meet market shortfalls, the kingdom has accelerated new home delivery, while other measures, such as encouraging real estate activity on unused land, are also under consideration. The government last month announced plans for a new tax on undeveloped urban land, aimed at pushing landowners to develop unused plots and ease the shortage of affordable housing. The state is also moving to free up more land and inject public funds into expanding stocks, as part of its programme aimed at adding at least 500,000 housing units for lower-income families. However, tougher mortgage rules introduced last November have seen residential property sales in Riyadh plunge, research from JLL shows, and the consultancy predicts the restrictions would spur further countrywide declines. Buyers can now borrow a maximum 70 per cent of a property’s sale price; previously, there were no sectorwide limits. The restrictions aim to prevent a bubble forming in residential real estate of the kind seen in Dubai, UAE, several years ago. Authorities want to encourage home ownership and prevent ordinary Saudis from being priced out of the housing market. But the market’s initial reaction to the restrictions shows how difficult it can be to adjust supply and demand in line with social objectives in Saudi Arabia, which faces a shortage of available land and a rapidly growing population, the report says. BMI’s Infrastructure Key Projects Database includes around $180-billion worth of transport infrastructure projects, of which $74-billion worth are currently under construction. While this supports BMI’s forecast for strong growth over the short term within the sector, with just less than $90 billion spread across all pre-construction phases, the rate of replacement for projects currently under construction is unlikely to be sufficient to maintain growth over the long term. With many of the major transport projects under development having been awarded over the past four years, the majority will reach completion by 2018. As such, BMI forecasts a slowdown in the sector, although the rail sector will continue to keep growth elevated with projects such as the Saudi Landbridge and the second and third phases of the Makkah Metro, which is expected to still be under construction post-2020. After averaging 9.4 per cent real growth between 2015 and 2019, the sector will post slower growth averaging 6.6 per cent from 2020 to 2024, the report says. According to the Key Projects Database, the rail sector accounts for the majority of the value of projects currently in planning or under construction in Saudi Arabia. Major expansion is under way and planned for the rail sector, as the country prepares to be an integral part of the GCC’s railway network. Among the major public transport infrastructure are the metro systems in Riyadh (now under way) and Makkah as well as the Saudi Landbridge. Consultrans was selected in September 2014 to conduct a feasibility study on the construction of the Landbridge, which is a 480-km high-speed railway line between Riyadh and Dammam. Trial runs on the first completed section of the Haramain high-speed railway line are set to start shortly. The line will connect Madinah to Jeddah and Makkah. The proposed $12-billion Jeddah metro, which is slated to start operations by 2022, is already facing some significant issues before construction starts, such as infrastructure, traffic flow and ownership of land, says the BMI report. British architecture firm Foster + Partners has been appointed to develop the architectural vision for the city’s public transport system (see Saudi Focus). In addition, Louis Berger has been named the programme management consultant for the Madinah transportation infrastructure (see Saudi Focus). Saudi Arabia is making significant investments in its airport infrastructure, some of the largest projects being the expansion of King Abdulaziz International Airport in Jeddah. The SR27-billion ($7.2 billion) first phase expansion will boost the airport’s capacity from 17 million to 30 million passengers annually. Riyadh’s King Khalid International Airport is also in the midst of an expansion, while a new airport is being built in Abha. Meanwhile, the new Prince Muhammad Bin Abdul Aziz International Airport in Madinah conducted trial operations last month. The airport, occupying an area of 4 million sq m, has been built at a cost of about $1.4 billion. It consists of arrival and departure lounges covering an area of 153,000 sq m and 16 gates connected to aerobridges. The airport’s current annual capacity of eight million passengers will increase to 12 million when it is officially inaugurated. According to BMI, the energy and utilities segment will outperform all other areas of the infrastructure industry as Saudi Arabia moves to diversify its power mix and boost generation capacity. Conventional thermal generation projects will be the main driver of the 11.8 per cent average real growth over the next four years, while renewables will increasingly support growth towards the end of its 10-year forecast period. Saudi Arabia’s rapidly expanding population and industrial base, coupled with artificially low power tariffs and inefficient use of electricity, has significantly increased power demand across the country, the report states. This has led to shortages, blackouts and power rationing in some parts during peak demand periods. In an attempt to address these dynamics, boost generation capacity and also divert more oil to export markets, Saudi Arabia is investing heavily in alternative power sources. Similarly, to better cope with seasonal rainfall and inefficient water use, there are billions of dollars being invested in water and sewerage infrastructure. Excluding Saudi Arabia’s planned nuclear reactors, there are around $35 billion of power plant and transmission grid projects within BMI’s Infrastructure Key Projects database. These are currently under construction, have been awarded or are in the planning phase. Included in this figure are 23 power generation projects with values ranging up to $3.6 billion. Saudi Arabia aims to increase its generating capacity from the current level of 55 GW to 120 GW by 2020. In an important development in the sector – and one highlighting the potential for innovative technologies in the Saudi power market – the German engineering conglomerate Siemens signed a $966-million contract with Saudi Aramco to supply key components for the 4,000-MW Jazan combined-cycle power plant. This is the latest development in the kingdom’s bid to bring online what will be the world’s largest regasification-based power plant, BMI says. Another project which is notable for its use of innovative technology is General Electric’s SR4.5-billion ($1.2 billion) contract from state-run Saudi Electricity Company (SEC) to set up the country’s first fossil fuel and solar power plant near the Red Sea port of Dhuba. The contract includes the construction of supply lines to Tabuk. The 600-MW integrated solar combined-cycle facility will mainly burn natural gas, but also produce 50 MW using solar energy to boost fuel efficiency. It will be commissioned in 2017, according to the Arab News. The Saudi government is planning further expansion of its travel and tourism infrastructure, with the aim of attracting 88 million visitors by 2020. Religious tourism continues to be a key revenue earner, with the rising number of pilgrims visiting Makkah and Madinah having fuelled an ongoing real estate and construction boom in these two holy cities. According to JLL, the kingdom’s massive $21-billion redevelopment of the Grand Mosque – Islam’s holiest mosque – and surrounding areas have sparked a resurgence in the area’s real estate. The Grand Mosque is being renovated and expanded to accommodate 1.5 million pilgrims at one time in the site’s largest redevelopment in history. The government is also redeveloping the city’s slums, including expropriating thousands of properties, which involves paying more than SR100 billion ($26.65 billion) in compensation. Among the largest developments near the Grand Mosque is Jabal Omar Development Company’s project which – now in its fourth phase – involves the construction of 37 hotel towers and serviced apartments. The project has a total built-up area of around 320,000 sq m and will be delivered over a three-year period in January 2017. Other major developments under way in Makkah include Wahat Makkah, a large and high-profile integrated development complex which will have a total of 2,200 apartments when complete; the low-rise Al Muzdalifah Government Complex, which will cover a total area of two million sq m; and the development of a 1.5-million-sq-m site in the Bawabat Makkah area. The hotels sector will be one of the major beneficiaries of Saudi Arabia’s tourism drive, owing to a limited supply of modern hotel stock, particularly with regard to international brands. According to a recent survey by Viability Management Consultants (VMC), Makkah will add 13,724 hotel rooms, Riyadh, 8,954, Jeddah, 7,969 and Al Khobar/Dhahran/Dammam, 1,729. Several of the world’s leading hotel chains currently have significant numbers of hotels under development in Saudi Arabia, notably Starwood Hotels & Resorts and Carlson Rezidor. Starwood Hotels & Resorts has several properties in the pipeline for the kingdom, according to information on its corporate website. The company plans to open the 238-room Aloft Riyadh shortly, the Sheraton Makkah and The Westin Makkah in July and the Four Points by Sheraton Dhahran in December. These will be followed by the Four Points by Sheraton Makkah in July next year, the Four Points by Sheraton Mall of Arabia, Jeddah and Le Meridien Riyadh in September next year and the Aloft Riyadh King Fahd Road in January 2017. Carlson Rezidor has a significant number of properties in the pipeline across both its Radisson Blu and Park Inn by Radisson brands. The company will add the following hotels to its local portfolio: the Radisson Blu Hotel & Residence, Jeddah Corniche, which is planned to open in mid-2017 with 100 rooms and 60 serviced apartments; the 261-room Radisson Blu Red Sea Palace Hotel, Jeddah; the 120-apartment Radisson Blu Plaza Residence, Jeddah Salihiyah, which is scheduled to open shortly; the 184-room Park Inn by Radisson Hotel Riyadh Nasiriyah, which will open early next year; and the Park Inn by Radisson Dammam, which will have 90 rooms and is due to open shortly. Major projects expected to be completed in 2015 include Hilton Riyadh Hotel & Residences and Movenpick Hotel in the commercial business district.